2013 Nissan Juke Nismo 4WD CVT review | What Car? The Nissan Juke Nismo is a rival to various hot hatches, including the Renaultsport Clio 200 and Ford Fiesta ST. It's intended to be fun and desirable, yet useable on a daily basis. The Nismo's 197bhp 1.6-litre turbocharged petrol engine has 9bhp more than the unit in the standard 1.6 turbocharged Juke, while its torque is up by 8lb ft to 185lb ft. The Nismo upgrades also include stiffer suspension, quicker steering, 18-inch alloys, suede-trimmed sports seats and sat-nav. We’ve already tried the front-wheel-drive model with the manual gearbox. This time we’re driving the automatic CVT gearbox version, which costs £2205 more, and has the ability to switch between two- and four-wheel-drive. What’s the 2013 Nissan Juke Nismo 4WD CVT like to drive? Although the CVT Nismo has the same power and torque as the manual car, adding the mechanicals required to drive all four wheels means kerbweight is up by 125kg. The 0-62mph dash is therefore 0.4 seconds slower at 8.2 seconds, although the Nismo still feels punchy. The engine generates good torque from around 2000rpm, but the CVT gearbox stops you enjoying it. Left in automatic mode, the revs are allowed to climb and remain higher than needed when pushing on. It’s a noisy experience, with lots of engine drone. Switching to manual mode allows you select one of six pre-set gear ratios and contain some of that noise. The changes are relatively smooth and quick, but adding paddleshifters would have helped create a sportier feel. Like the manual, in 2WD mode the car spins its wheels a bit too easily if you put your foot down. However, most drivers will opt to leave the system in automatic, when it activates the four-wheel drive if the front wheels start to slip. However, the Juke's front tyres still run wide if you go through a corner too quickly, but it does avoid the tyre scrabbling of the front-drive car. The revised suspension keeps the body reasonably well under control. Ride quality has suffered in the name of this cornering prowess; sharper bumps and potholes are quickly transmitted through to the cabin, although the Nismo is fine on smoother A-roads. What’s the 2013 Nissan Juke Nismo 4WD CVT like inside? The sports seats are excellent, with enough adjustment for them to be comfortable and supportive for most front occupants. Taller drivers may struggle, though, because the Juke's steering wheel adjusts for height only, not reach. The sports seats also reduce the amount of space for rear passengers. The interior is chintzy, and far from coherent, but it could appeal to those after a motorsport-influenced theme. Don’t expect the boot to be particularly useful, either. Adding the four-whee-drive system has cut space by 44-litres, which brings the carrying capacity down to a paltry 207 litres; roughly what you’ll find in most city cars. At least the standard equipment list is generous; it includes an upgraded Nissan Connect system that brings a 5.8-inch colour touch-screen, sat-nav and smartphone connectivity. The Juke Nismo just isn’t as sharp to drive as its rivals. If you want serious driving thrills, choose the cheaper Fiesta ST, while the Renaultsport Clio 200 is also automatic, easy to live with, better value and much more entertaining. Furthermore, the four-wheel-drive Juke Nismo is not only considerably more expensive than the two-wheel-drive car, it’s also slower, heavier, thirstier and less fun. 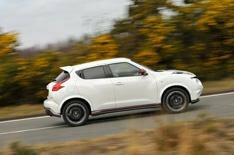 If it has to be a fast Juke, the two-wheel-drive manual 1.6 DIG-T foregoes 9bhp and the sportier touches, but is actually quicker to 62mph, comes with plenty of kit and costs a massive £4105 less.